Registration: This event fills every year so sign up early. Higher rated teams will get first chance to sign up so if you want in, pick the best partner available! There will fewer bells and whistles this year. One month after this event, Harvey County residents will vote whether or not to sell Camp Hawk. As a group, our focus has been on saving the park; so some of the extras returning Doublers have grown accustomed to have been sacrificed. Hence no Tourney Discs or Early-Bird donations. For those still wishing to donate, thank you: let’s talk at the event as we are currently exploring the legal requirements of collecting money for a campaign. 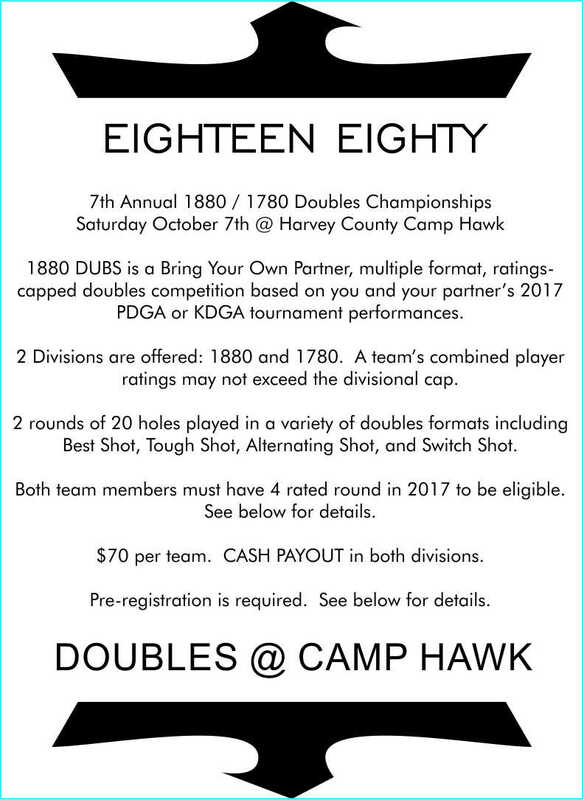 Despite the changes, 1880 DUBS will offer what it has always offered: Evenly matched teams, a gem of a course, and unique holes paired perfectly with challenging formats. Hope to see you there. If the tournament does not fill by next Friday (9/29), Reg will open to teams within 70 points (1710+ and 1810+). The goal of the tourney is get everybody on a level playing field. Whether you are 865 or 1010, you've got the same chance of winning. My job is the ratings. Your job is picking the best partner. If we are both successful, the winners of 1880 are the two people who worked best together and realized their full potential. This year I'm giving you time to find that perfect partner. Because it can take time. It does take an effort. But that effort is what makes this tournament unlike anything you'll play all year. So don't aim for ordinary. This might be our last crack at this. Secure your spot by giving yourself your best chance at glory. Best Shot: Players A and B both drive. They decide which of their shots to throw from. Both throw. Repeat. Tough Shot: The same as best shot except after A and B throw their opponents decide which disc A and B will throw from next. Repeat until 1 putt is made (both players do not have to make the putt). *You MUST choose the disc that you feel will result in a worse score for your opponents. Failure to do so will result in disqualification of BOTH teams. *1780 will play Tough Drive (opponents choose) then finish the hole as Best Shot. Switch Shot: Players A and B drive. Player A finishes the hole from B's drive. B finishes the hole from A's drive. The better score is taken. Switch Bonus: Same as Switch Shot but if each player gets a 2, the score is recorded as a 1. Alternating Shot: Player A throws first. B throws second from A's lie. Continue alternating shots until the hole is completed. *Maintain the order through the entire 3-hole section of Alt Shot holes. If A taps in the putt, B drives the next hole. *You can choose which player starts each 3-hole section. If you start the round in the middle of a 3-hole section, remember your order when you resume that section at the end of your round.